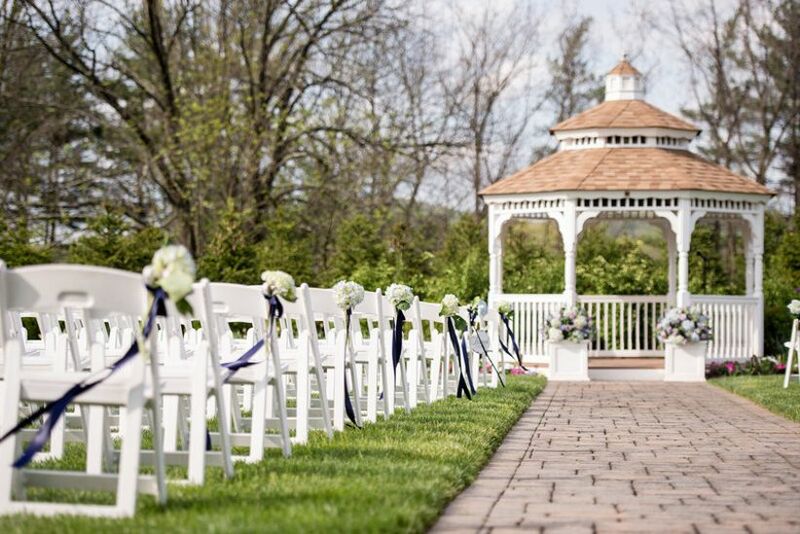 Whether you're dreaming of a classic country club, a lush garden, or a rustic woodland setting, there are so many outdoor wedding venues in NJ to choose from! New Jersey is called the Garden State for a reason. Turns out there are numerous outdoor wedding venues in NJ that combine beautiful scenery and photo ops with convenience—many are mere minutes from New York City or Philadelphia. 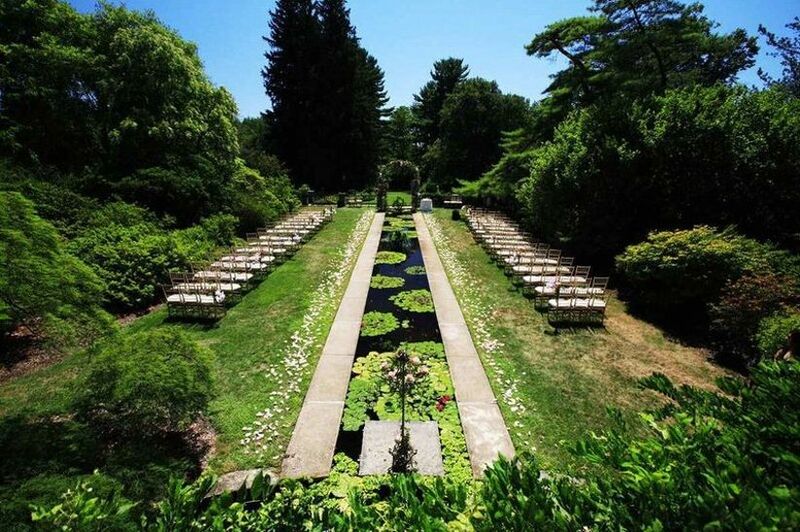 Whether your dream venue is a lush garden, historic manor, rustic nature venue, or a posh country club, New Jersey has so many outdoor spaces to choose from. 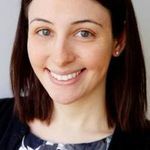 Ready to find your outdoor wedding venue in NJ? Check out a few of our favorites! This historic country estate combines the romantic vibe of an outdoor wedding venue in New Jersey with the convenience of an all-inclusive location. 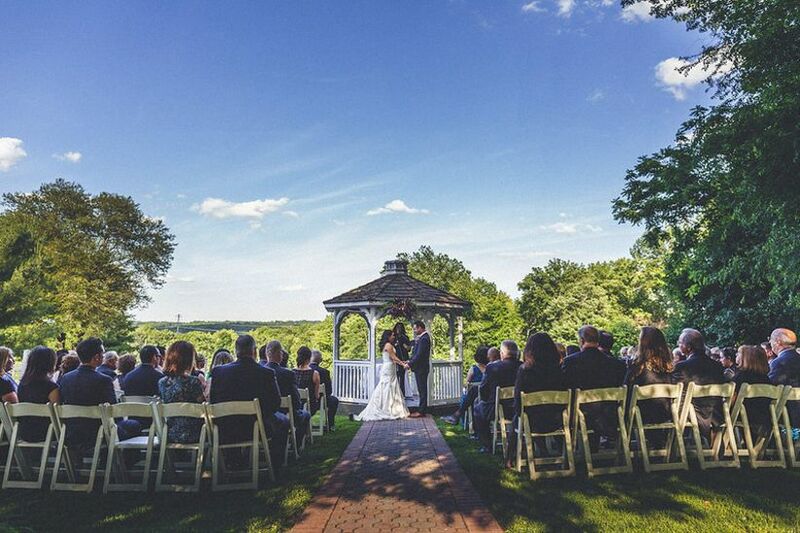 Set on ten acres in Hunterdon County, The Farmhouse at the Grand Colonial offers a lovely outdoor ceremony spot, complete with gazebo, and a variety of photo backdrops, including a majestic oak known as the “Kissing Tree” and a historic stone schoolhouse. This Couples’ Choice Award-winning venue also has a grand ballroom for indoor receptions, which can accommodate up to 250 guests. Country clubs are known for their expansive outdoor wedding spaces, and this Boonton venue has more than 360 acres of space for your big day. The ceremony space is oh-so-scenic, and the Grand Ballroom, though indoors, features panoramic windows with views of the outdoor space. This Couples’ Choice Award winning venue offers in-house catering, and has space for up to 500 guests. Couples rave about the venue’s accommodating staff and delicious food. 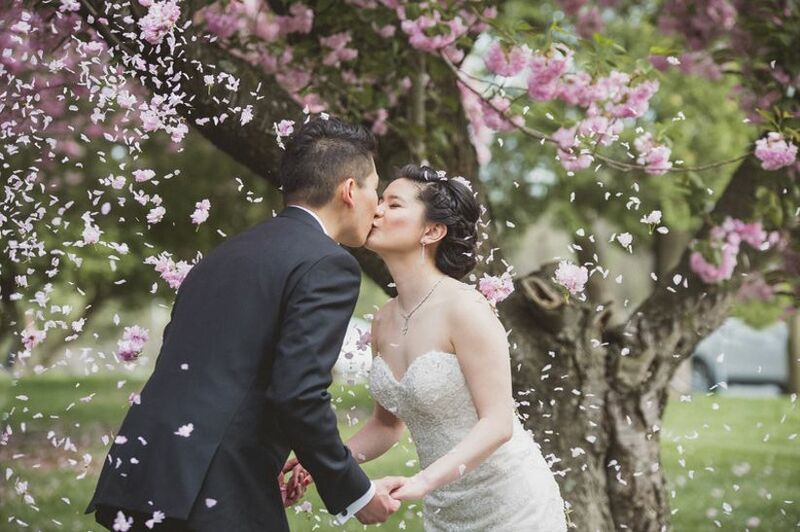 Garden weddings are romantic and dreamy, and this garden wedding venue in NJ is all that and more. 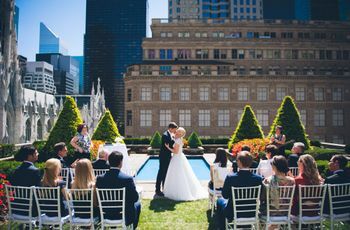 This Georgian-style mansion, located less than an hour outside of New York City, has a gorgeous Veranda and gardens for fairytale outdoor ceremonies, as well as a Grand Ballroom complete with 25-foot-high ceilings, floor-to-ceiling windows, and luxe chandeliers. 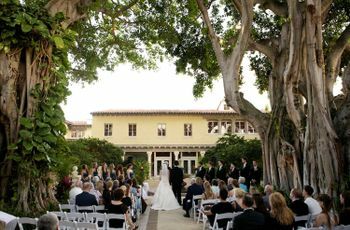 This all-inclusive venue has won numerous Couples’ Choice Awards, and offers truly gorgeous photo backdrops, from gorgeous fountains to stone gazebos and more. 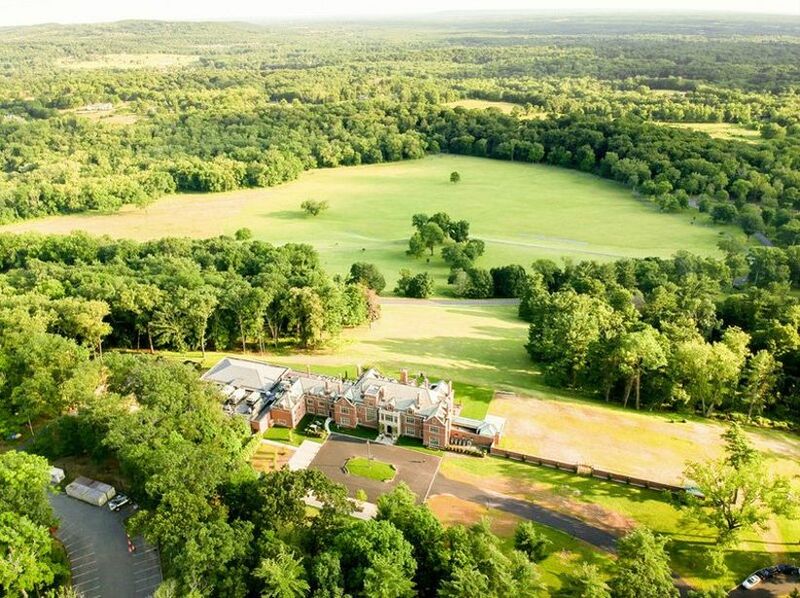 If you’re hoping to feel like royalty on your wedding day, check out this grand, castle-like New Jersey wedding venue. Skylands Manor in Ringwood is set within a 1,000-acre park, which includes 100 acres of formal botanical gardens (hello, incredible photo ops!). Host your ceremony in the tree-lined orchard or in one of the other outdoor spaces. The manor home itself features a recently-renovated ballroom. This Couples’ Choice Award winning venue is all-inclusive, so your planning process is sure to be a breeze, plus there are 24 guest rooms on site so your wedding party can stay the weekend! 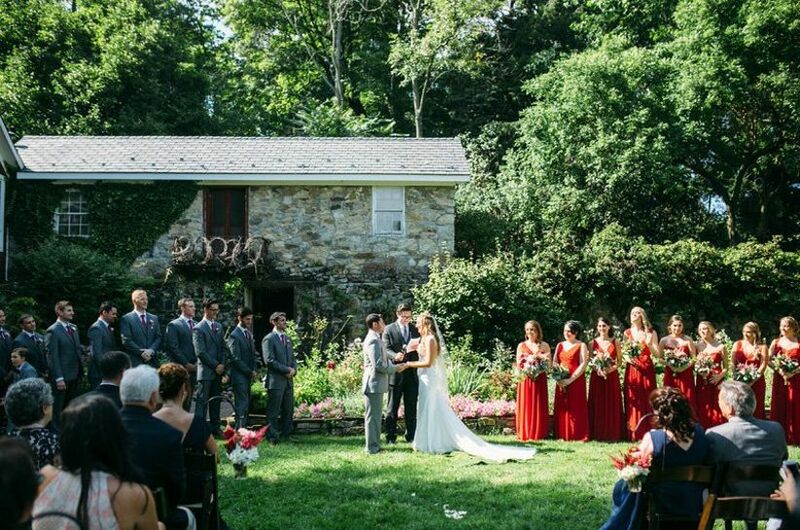 This charming 200-year-old farm and estate is one of our favorite outdoor wedding venues in NJ. The English Garden is ideal for ceremonies, and you can host your reception in the 25-foot-high tent or inside the Farmhouse Ballroom. With space for 280 guests, you’ll love the lush gardens at this Andover venue, plus the fact that there’s in-house catering and—major bonus!—a fire pit for end-of-the night s’mores. 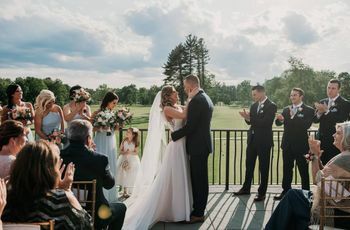 This Northern NJ golf resort complete with mountain views has five venues for outdoor weddings, from golf courses to a rustic lodge or a charming pavilion. The Grand Cascades Lodge is the largest, and has a ceremony space with truly spectacular mountain views, plus a ballroom that can accommodate up to 300 guests. The Ballyowen Golf Club has an Irish feel with rolling farmland and an Old World-style event space. Your guests can stay onsite to turn your wedding day into a fun-filled wedding weekend. 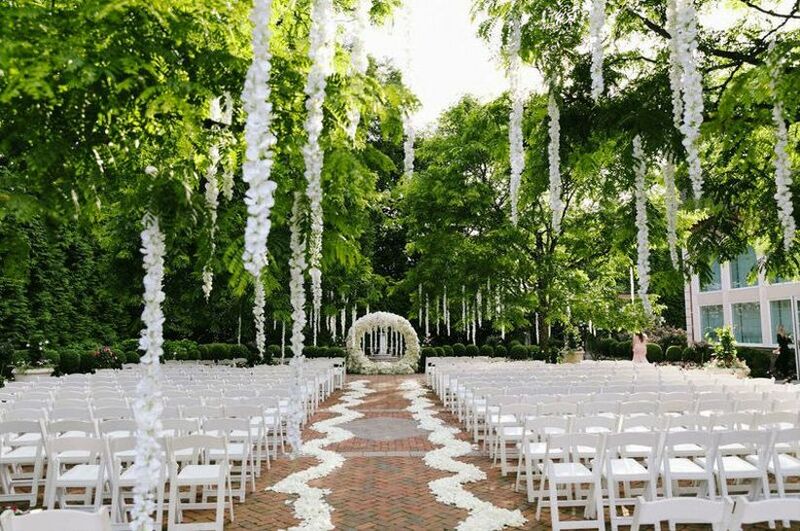 Conveniently located in West Orange, this outdoor wedding venue in NJ is truly luxurious. We love the outdoor ceremonies space in a serene meadow, featuring grand trees, ponds, streams, and bridges with the historic French-style mansion as a backdrop. Receptions are held in the Grand Ballroom with its unique rotunda ceiling. This all-inclusive venue has space for up to 400 guests, and there’s even a heliport onsite, so you can make a truly celeb-style entrance or exit. 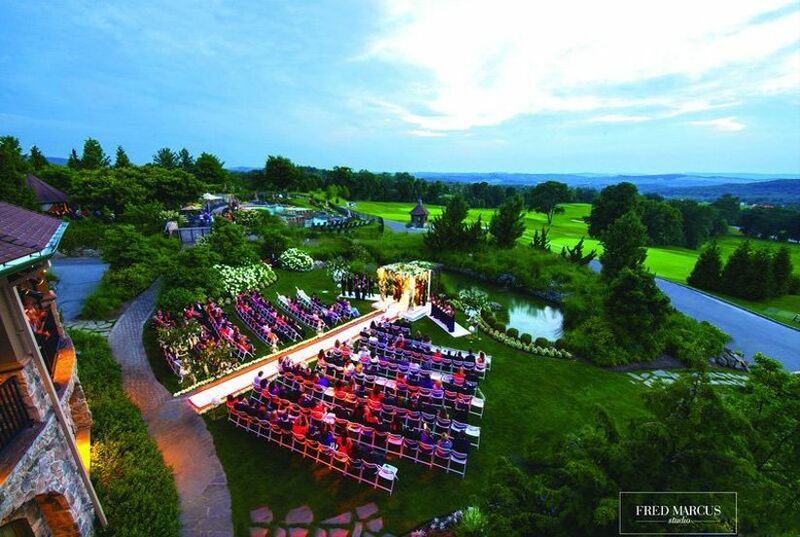 This resort in Peapack has one of the most scenic ceremony spaces we’ve seen—your guests will truly be wowed by the breathtaking views of the rolling hills. Receptions can be held inside the 1912 mansion’s ballroom, which can accommodate up to 225 guests and features a 26-foot “living wall” of local flowers, or the more intimate Ninety Acres restaurant, with space for up to 120. You’ll love working with the onsite chef to create your custom menu at this Couples’ Choice Award-winning venue as well! 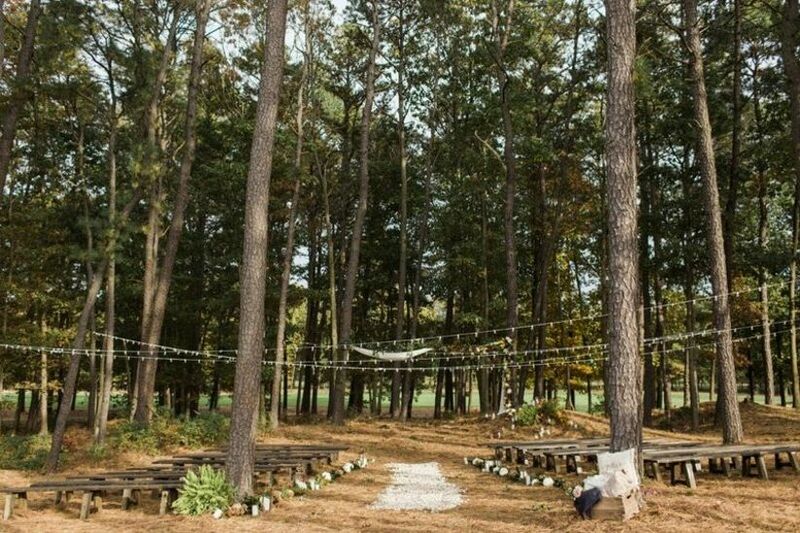 If you’re looking for a rustic woodland wedding setting with the convenience of an all-inclusive venue, this outdoor venue in NJ may be just the place. 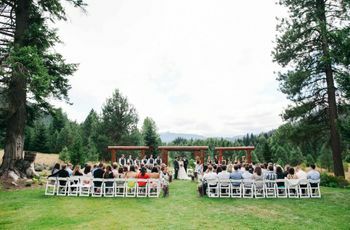 Ceremonies here can be held in the Timbers, a secluded wooded space replete with natural beauty. There’s also a more classic outdoor ceremony space complete with romantic pergola. Cocktail hours are held on the patio, and the light-filled clubhouse wins raves for receptions. This Couples’ Choice Award-winning venue is just the place to host weddings of up to 200 guests. 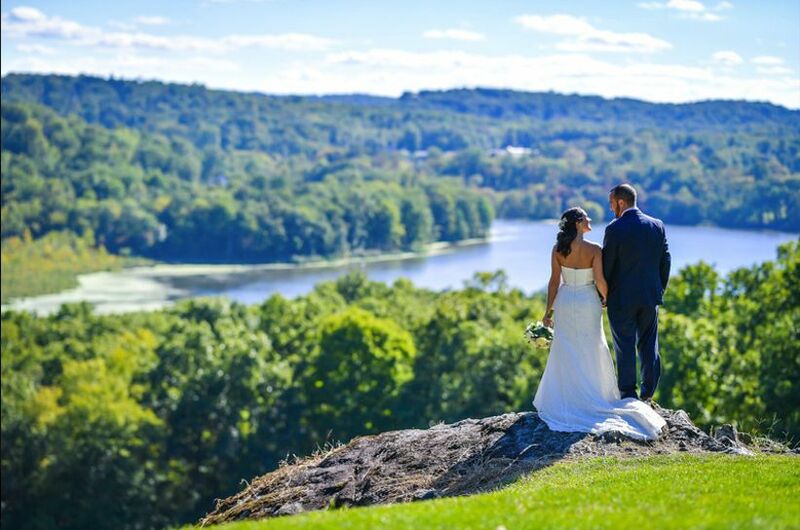 Located an hour outside of New York City, this country club wedding venue features some truly jaw-dropping mountain views. You’ll love the venue’s rustic feel, complete with log cabin and barn, plus 190 acres of outdoor space. The ceremony space features a charming gazebo, and the reception space has floor-to-ceiling windows. SkyView Golf Club has won multiple Couples’ Choice Awards, and can accommodate up to 200 guests. 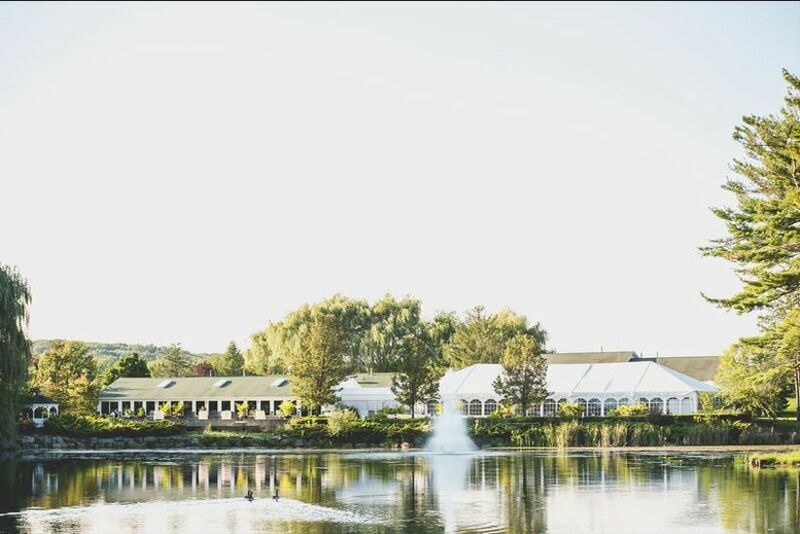 Host your ceremony and reception at this secluded resort in Central Jersey, complete with nature-filled outdoor ceremony space and tented reception space. 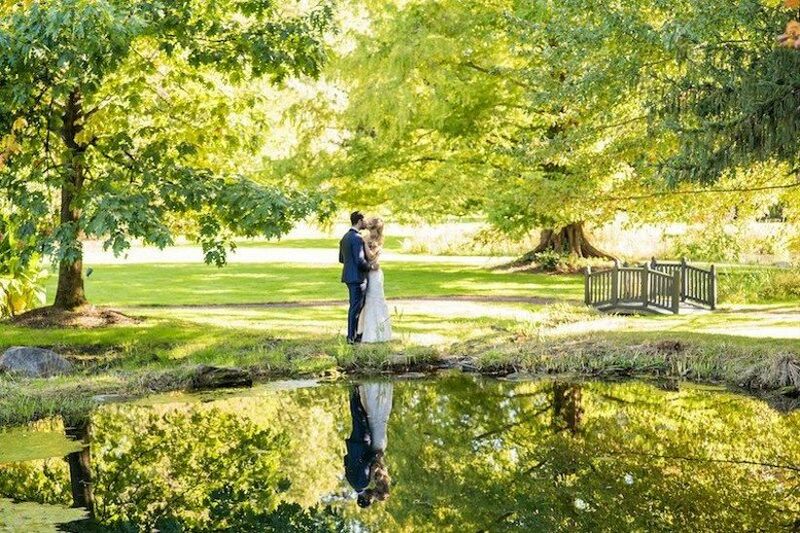 Windows on the Water at Frogbridge has so many incredible photo backdrops, including the serene lake with three-tiered fountain, gardens, and more. The reception tent is climate controlled for your guests’ comfort, and can host up to 300 guests. This Couples’ Choice Award winning venue wins raves for the highly-regarded food (yes, this is an all-inclusive venue, too!) and staff willing to go the extra mile.